Drip, drip, drop, click, bugger! … or in other words… rain… followed by another wiper fuse blowing. For those of you that need a recap, I’d tested the wipers in December, prior to the IVA (Individual Vehicle Approval) test, and they had also been tested by the dealer that sold me the kit, Williams, at the Post Build Check. However, on the morning of the IVA, at 7:30AM, just as the heavens opened, and as I was pulling off our driveway, they stopped wiping and just sat still. I had to drive to the test centre, getting wet and knowing that with the wipers broken I was heading for a certain failure. We did get them going again during the IVA but only with the help of a very considerate examiner and a spare fuse. 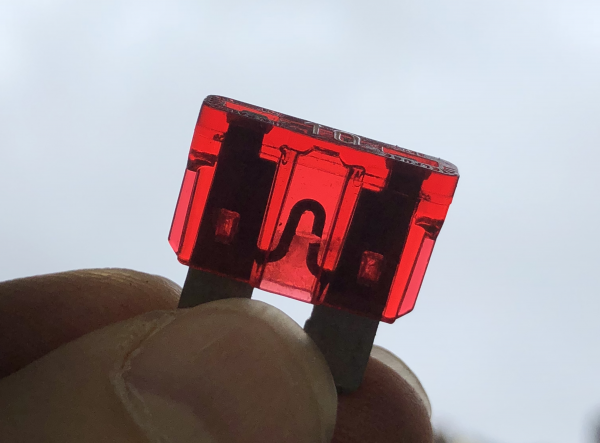 Since then the wiper fuse has blown a total of 4 times, not a big problem, mainly because I was intrigued as to what was going on and was increasing the fuse size as each new fuse blew. A couple of the times it blew was when I was testing, but it also blew a couple of times when it mattered and I had to drive in the rain with no wipers. But fortunately, I had decided to carry spare fuses after my school-boy-error of not taking any to the IVA test. Well, of course, the standard response to any fuse failure is to adopt the age old course of action: throw in a bigger fuse and see what happens! As the fuses kept blowing I’d managed to “do in” two 10As (factory fitted), two 15As and then finally found that a 20A held. I was still rather in the dark as to what was actually going on though. Was there a current spike that was “just about” holding with a 20A? Or was it more of a sustained current draw that was within the limits of this 20A… and of course, why do I need a fuse that’s double the factory fit item? 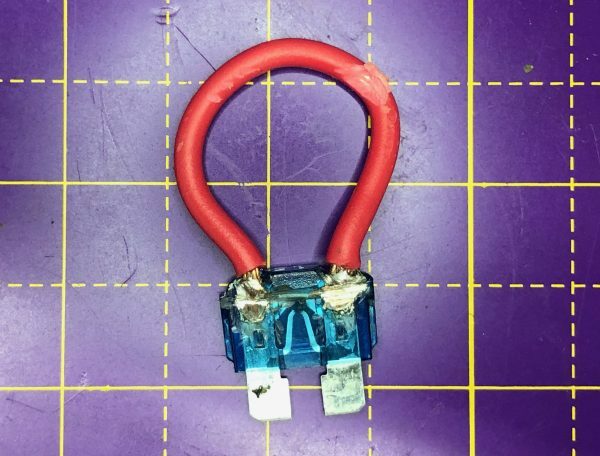 Now, sticking in a 20A is not quite the bodge-it-and-scarper approach that it would be to use a piece of tin-foil across the fuse terminals… as had been suggested by some, but it was close. I went through a bunch of possible options that might be causing the problem. Clearly there was too much current being drawn as the wiper motor started. 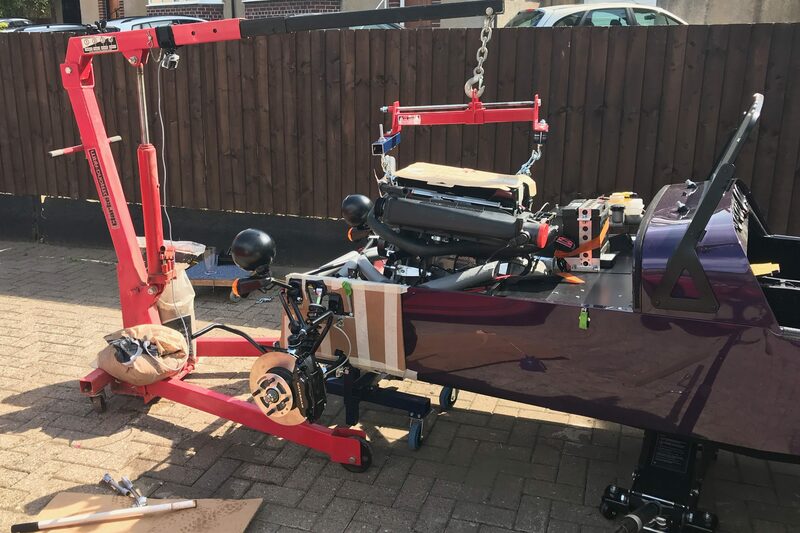 But I couldn’t imagine Caterham fitting a 10A fuse when they knew there was a startup problem with the motor… or could they? Of course this could be a defective motor, or there was some inrush current protection missing from my car. Other options I thought of mainly revolved around the mechanical linkages getting “bound” and causing a higher than normal stall current in the motor. If that were happening then it would probably happen at some point no matter how long the wipers had been running… i.e. it could bind at a particular point in the cycle but it could take a few cycles before the problem showed itself. That didn’t seem to be what was happening…. the fuses seemed to all blow when the wipers were first switched on… and more than that, at the very point the wiper switch was flipped. It did catch me out once when I thought that wasn’t the case, but in the end I decided that I had gone from slow-wipe to fast-wipe and the wipers had stopped mementarily in between those modes – so inducing a “start condition”. It seemed to me that if it was a mechanical bind then at some point in the wiper motion there would be a sticky point and the current would increase there. But it doesn’t feel like that’s what’s going on. Ok, so it’s probably something to do with startup current. But how am I going to see exactly what’s going on. Hmm. A volt-meter or ammeter isn’t going to be able to tell the story at the split second when the wipers start up. I could use an oscilloscope but the only one’s I’ve got are 15+ years old and are not the sleek slim LCD units you can buy these days. I’ve also got some similarly old logic-analyzers that I could have broken out, but they too are bulky and difficult to extract data from to include in this blog. Very Web 1.0. 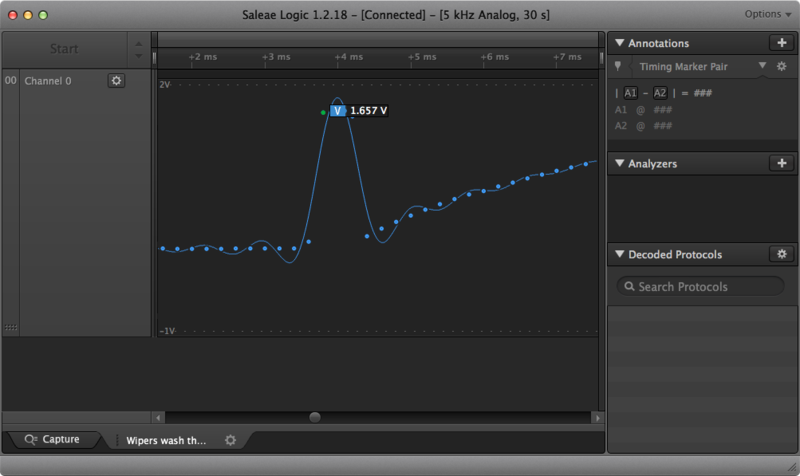 Bring on the Salaea Logic Pro 16. 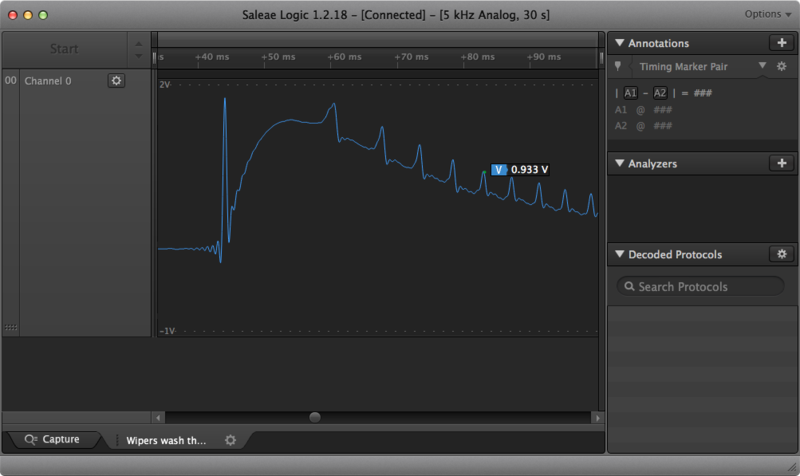 My modern way of doing oscilloscope and logic analyser work is to use the logic/analogue PC dongle from Saleae. They come in different sizes, i.e. inputs, speed and colors. I have the 16 channel Pro version in a fetching anodized red. Salaea can be found at www.saleae.com. The Salaea 16 Pro is an great bit of kit. It plugs into a USB socket on your PC and can deliver up to 500Ms/s (mega-samples per second) logic acquisition and 50Ms/s analogue acquisition all from a box that fits in the palm of your hand. Each of the 16 channels can be set to logic or analogue acquisition and the whole thing also takes its power from the USB bus, so only needs a single cable. I only need a single analogue input for this investigation, but nice to have 15 backups! 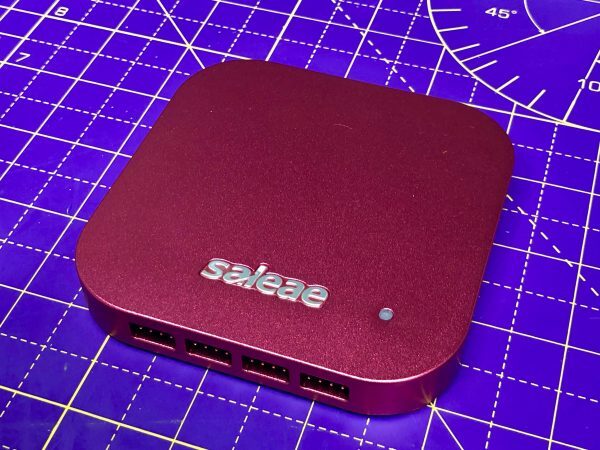 I think for the higher acquisition rates you need to have a USB 3 port on your computer but for what I needed in this project, USB 2 was going to be fine. It’s also really tiny so hooking it up to a laptop meant that if I wanted to I could “go mobile” and connect up the rig to the car as I drove around. In the end I didn’t need that, but it was always an option. On the PC side of things… I’m a Mac sort of person, so I had the Salaea hooked up to a Mac Book Pro. That’s way overkill for what I needed but if I wanted to “go mobile” I would have broken out an old MacBook Air or something. Salaea are beta’ing (as I write this in April 2018) a live capture mode too… the current release of software only lets you see results once a capture has run. Again, that’s fine for this project but I’m looking forward to finding other projects where I can use that feature. That’s the tool sorted, now how do I connect it to the car. Hmmm… So… I’m looking to get current measurements of the wash-wipe circuit. I either need to put an ammeter type device in series with the circuit or I need a current probe. 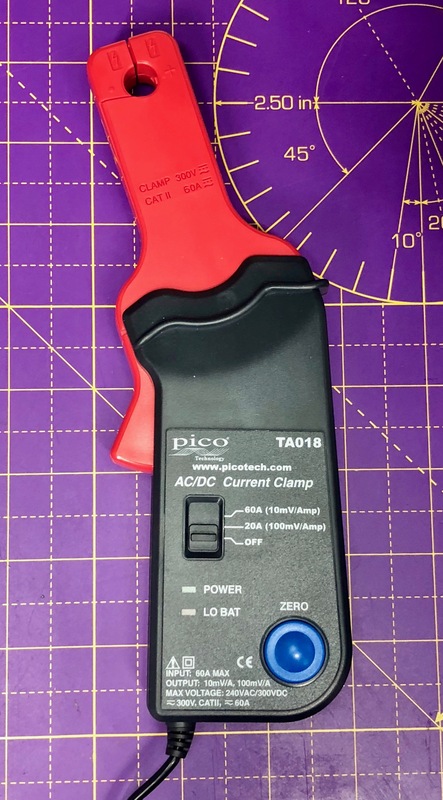 I don’t have anything I can connect to the Saleae that is like an ammeter or that I could construct… to do that I would need an accurate and low resistance that’s in series with the motor and that I could then measure the voltage drop across. We’re talking about 10 or more amps here so the resistance would have to be very low – or else I’m going to be affecting the measurements by adding more power draw and voltage drop. I didn’t have those sort of components to hand. My solution was a current probe. I have a 0-20/0-60Amp dual range current probe that generates a 10mV/Amp and 100mV/Amp in it’s two ranges. For a load of less than 20A (my 20A fuse is holding, so I’m interested in less than 20A draw) the lower current range of 100mV per amp should do nicely. For those not familiar with current probes, they measure the net current flowing through any wires passing through their jaws. The effect is an electromagnetic effect that we won’t go into here. However, the result is that the net current flow produces a proportional voltage response on the probe’s output. My next problem was that the current probe has a BNC connector on the end. That’s fine for the old-school oscilloscopes but not what the Saleae needs. It uses 1/10” headers for its input and has breakout leads that can hook up to 1/10” headers or at a push bare wires. I was unlikely to need the BNC connection type again, so… off with its head! 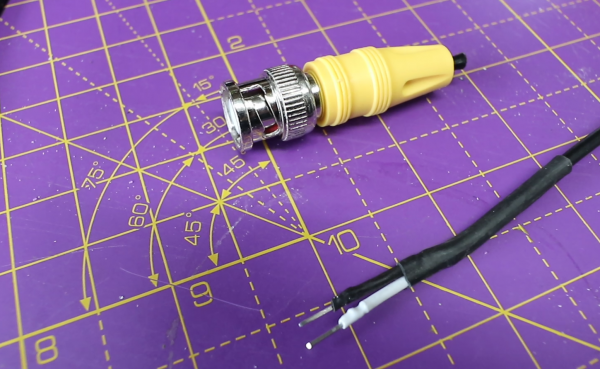 I could have made a BNC to 1/10” converter cable, but I was feeling lazy. That being said I also couldn’t just hack off the ends, I did need to at least provide something a little more professional – OCD, moi?! 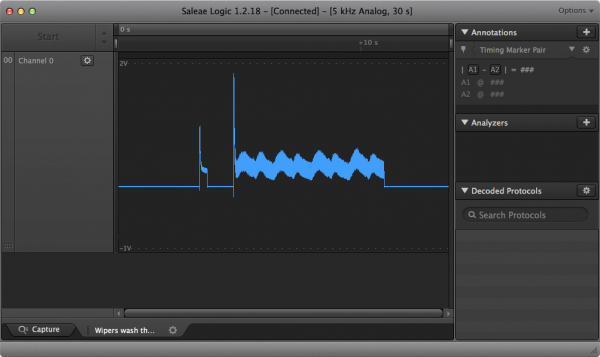 Back on the Saleae side of things, it’s analogue inputs are configurable up to a maximum input voltage of 3.3v. So, with 20A and 100mV/A, I need a voltage range of 0-2V – that’s perfect for the Saleae. Bostin! I dangled myself into the passenger side footwell hoping that the wiper motor wires were accessible – they weren’t. The wiper motor is tucked up under the passenger knee panel. Hmm. I could of taken the knee panel off but I was feeling lazy, as discussed above. What about getting the probe on the back of the fuse panel. That had been the plan all along. But there wasn’t a lot of room there either. I’d probably have to unbolt the fuse panel to be able to get at it. Hmm. Then came a eureka moment. I’m sure this is something that old hands know all about and use all the time. But I was pleased I worked it out myself… Use… a… modified… fuse (as pictured above). You’re regular automotive fuse is essentially a plastic molded holder for the fuse wire. My plan was that I could nibble away at the end plastic of a blown fuse and insert a wire loop that I could get the probe onto. It has to be a “blown” fuse or else my wire loop will only be in parallel with the fuse wire and I won’t “see” the full current in my probe. Then, once I have this fuse Frankenstein, I can pop it into the fuse socket for the wipers and attach my probe. Fuse with added wiring loop. I could probably do a neater job than this second time around if I had another go – but it will do. I had to file away some of my soldered connections so the fuse would fit back into its holder and the wire loop got caught on the soldering iron at one point and so I lost a bit of the insulation – it’ll do! And I also probably would have got the measurement done faster if I’d have taken the knee panel off… but lazy doesn’t mean lazy in all respects. When there’s a Eureka plan to hatch then lazy goes out of the window! And here it is in the car with the probe attached. Now to take some measurements. After a false start where I actually started to probe the wrong fuse, I finally found the right fuse (it’s tight up in that fuse box), and got to taking some measurements. I set the analyzer to 5ks/s and the full 3v3 input range. I didn’t need a lot of either time or voltage resolution… I was sure that anything that was going on was happening at the ms (millisecond) scale and not at the nanosecond scale. I was mostly right. The image above is a screen shot from the Saleae with the probe being connected into the wider fuse socket. The first spike is the ignition being turned on. Then we see a big spike where the wipers are turned on. There are then 8 “bumps” showing the wipers making 8 sweeps (4 cycles of left then right). It’s not totally obvious to me why there’s a spike associated with the ignition switch being activated – though I assume its something to do with the wiper reverse/park, there’s a momentary energising of the motor as the park circuit decides that the wipers are in deed parked. We can see that the initial in-rush spike is large but also drops very quickly only to be followed by a wider almost the same amplitude second wave of current. The 1.657V shown on the image indicates 1.657 X 10A (100mA/V), or 16.5A. Ok. Problem identified. The motor is drawing some 17A for about 0.6ms then almost the same for a much longer period. The shape of the curve is a little odd, there’s clearly a decay going on here followed by a cut-off, so I suspect the current peak is a lot higher than what I captured. This is firmly in line with the stall current theory, the magnetic fields build quickly and the current would be infinite if it wasn’t for the resistance of the windings. But in a real motor the currents aren’t infinite – luckily. Phew… my 3 years of university motor and electro-mag theory are paying off! 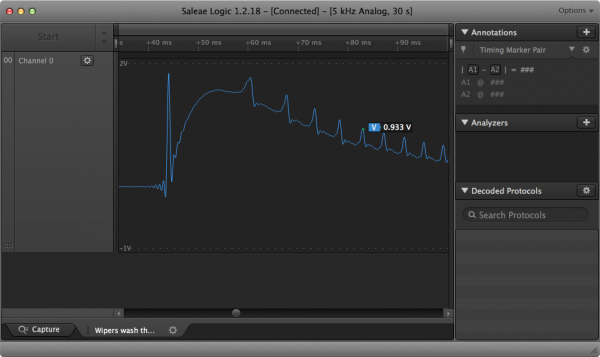 Time to dissect the time… and up the sample rate a bit. So, we’ve got a current spike when the wiper motor starts. That’s normal. And at the time scale that a wire fuse is going to be worried about (millisecond duration) the current draw is around 17A. The question is still: why is it so high? There’s some writing on the side of the motor that shows what looks like a “14W”. I’m not sure if that’s relevant but I’m clearly going to need to do some more investigating. Especially if the motor is 14W… the 17A startup current and the ~7A running current are way bigger than 14W. For those interested, 17A x 12V = 204W. You can do the other calculation if you like, consider it homework. That wold be 1/3 of a horsepower at stall… while that’s feasible, that’s not going to be needed to drive two small wiper arms I don’t think. One of the causes of the large spike, could be that the motor is faulty or at least the windings are at the low resistance side of a manufacturing tolerance. I’m certainly not going to be taking the motor apart to dissect it, but I might put a ohmmeter across the terminals if I take it out. Perhaps I still also need to look at the mechanical side of things. The wiper assembly shows the motor attached to a gearbox and then through a bar to two worm gears that drive the blades themselves. Maybe the gearbox is dry or the worm gears need lubricating. It should be simple to get some lubricant on the worm gears but getting the motor and gearbox out will have to wait for another day. 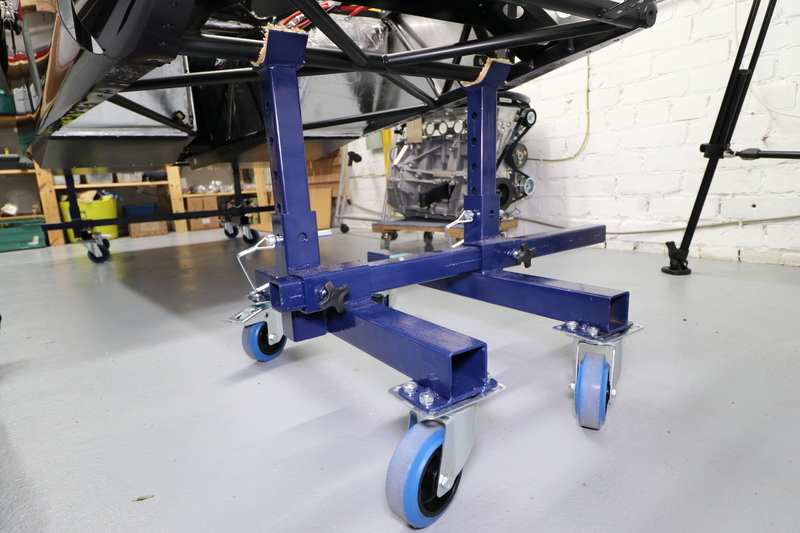 The only other option I can think of at the moment is that there should be some sort of shunt across the motor to dampen any inrush – perhaps that’s faulty, missing or not designed for. 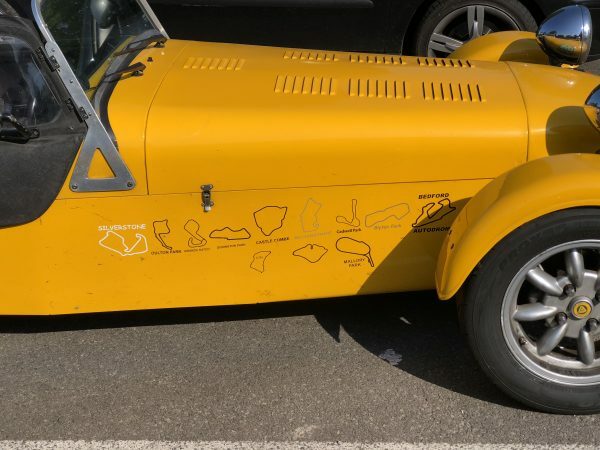 Next steps are to see if this is a common problem that I hadn’t been able to Google on Blatchat… and to do some digging to see if there are any clues on the Caterham supplied wiring diagrams (though I’m less than confident that they reflect how my car is actually put together). Well, I guess I still don’t know. Though I know more detail on what’s going on at the current level. And of course leaving the 20A fuse in place isn’t really a great option. The fuse is there, obviously, to protect against over-current. And with the stall current being below the fuse rating I have in there now, then a stalled motor isn’t now going to blow a fuse. 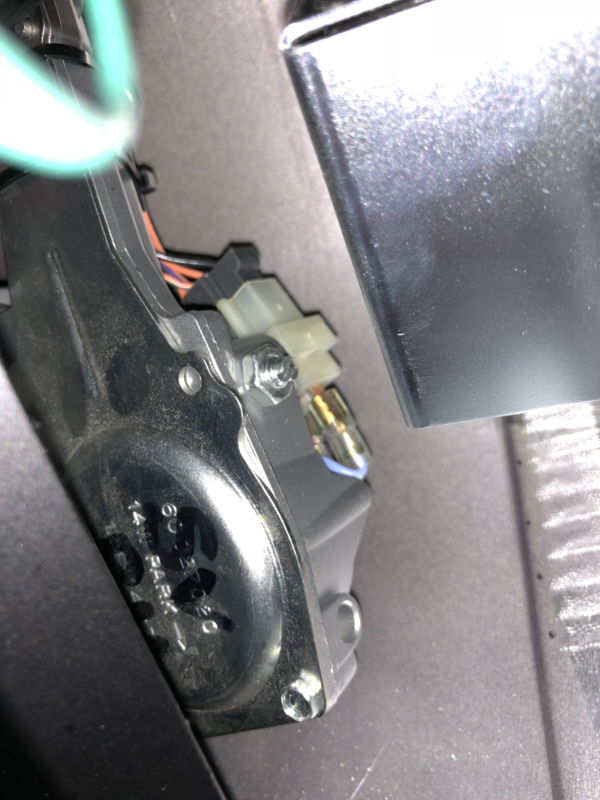 I guess if the motor does truly stall then it’s going to get rally hot too… that’ll reduce the resistance of the windings enough perhaps to increase the stall current and blow even the 20A fuse. 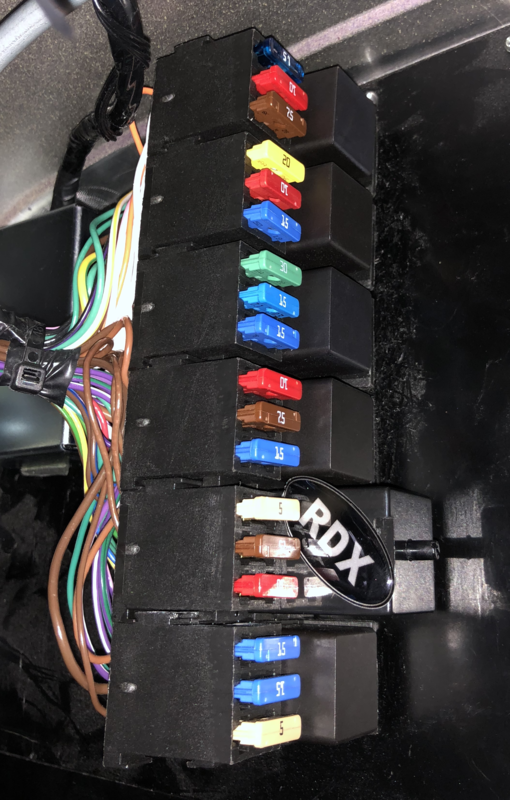 But that’s perhaps just wishful thinking… there’s a lot of metal in a wiper motor and it will take a long time to heat up and even then I doubt the winding resistance will fall low enough to blow the fuse. If I had a spare wiper motor I’d probably try that out – sounds like an interesting experiment. PS: This post was written in April of 2018 but for various reasons has only been posted now (June 2018). In the intervening time I’ve not had a chance to look any further at the Wiper Motor problem but my 20A fuse has held. Hopefully I’ll get a chance to look some more at this at a later date and report back. 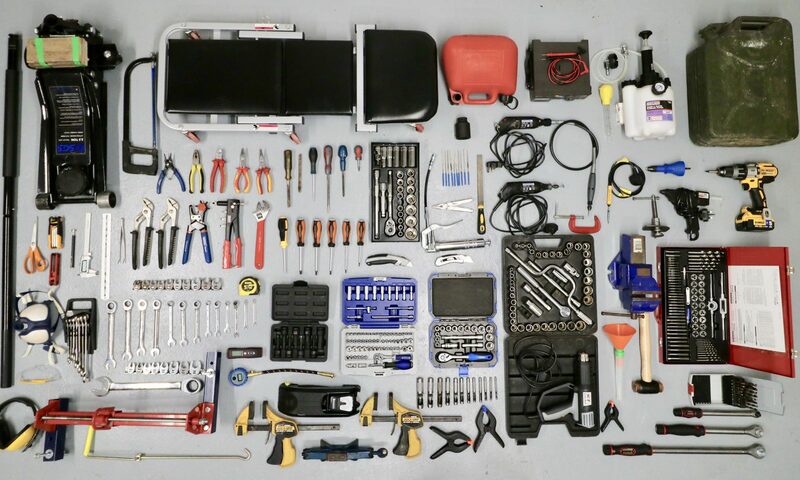 Warning: this post contains techie stuff. Sorry, had to get that out of the way. Some people will have gone by now, you can carry on reading if you like this sort of thing. So, this is my first YouTube video and creating this video of the day out was no mean feat. While I work with video every day and I know the fundamentals of Non-linear Editing (NLE) I’d not had a go at such a detailed video before. 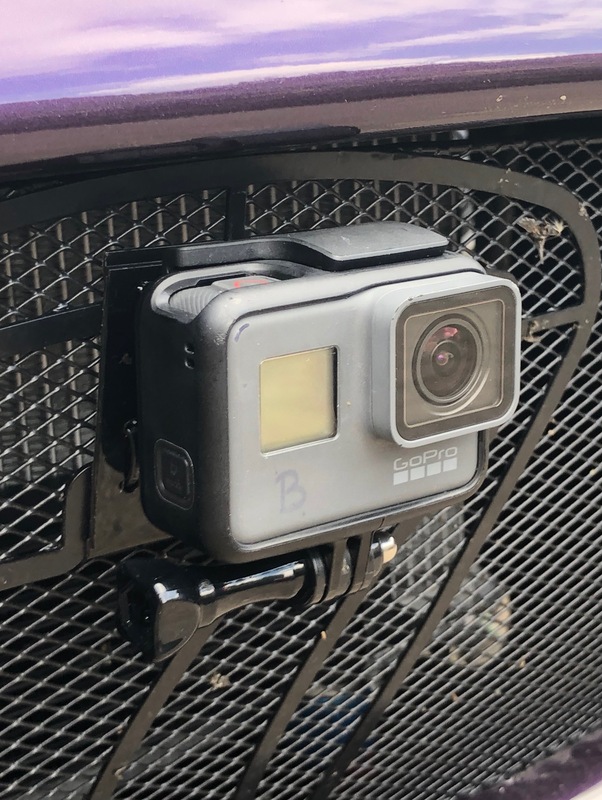 GoPro mounted to the front grille: This gave some great footage but the grille rattled on its mountings and gave some shaky footage at times. Also, the audio from it was compromised… but ok in places for establishing shots. I’ll need to see if I can stop the grille rattling – I had planned to do that prior to the run but ran out of time. GoPro mounted to the centre base of the windscreen: This gave us some great video of me and Joel. From the outbound fuel stop onwards gave us audio in device audio. This audio was really bad in places… I had the GoPro touching the screen I think and it kept on tapping against the glass giving a huge click on the audio. Prior to the first fuel stop Joel and I wore lav mics into a Saramonic wireless transmitter. 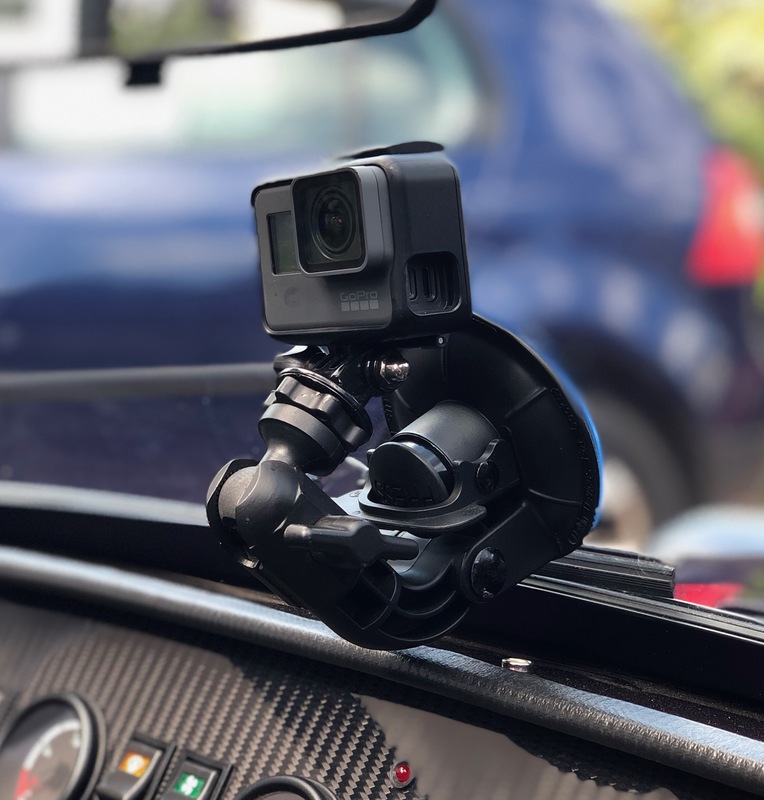 The receiver fed into the windscreen mounted GoPro, through the GoPro USB-C audio interface, and gave reasonable audio. GoPro mounted to centre roll over bar: Gave great video looking down at the road ahead, including Joel an me in the shot too. 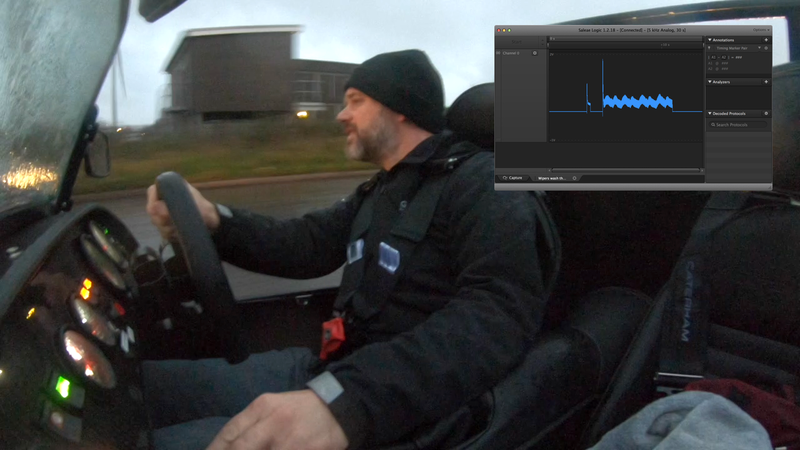 The audio from this camera was useless, as expected, when the car was moving but could be used sometimes when we were still. GoPro HERO 5 Black in the boot as a spare. 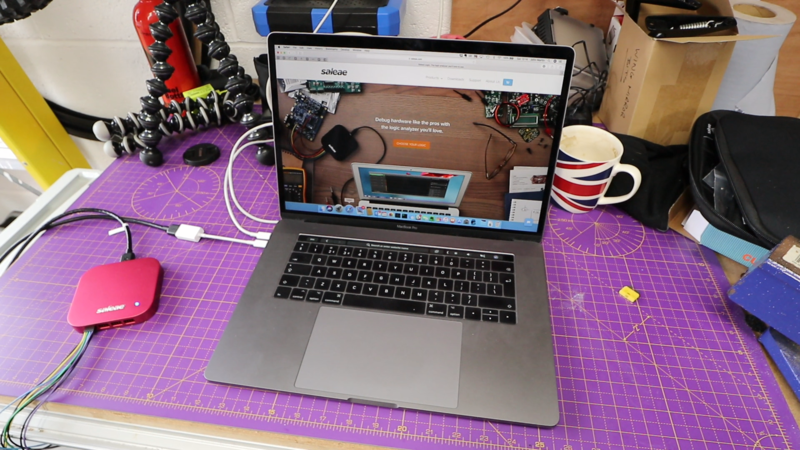 I also took two spare GoPro batteries, fully charged – and used both of them. 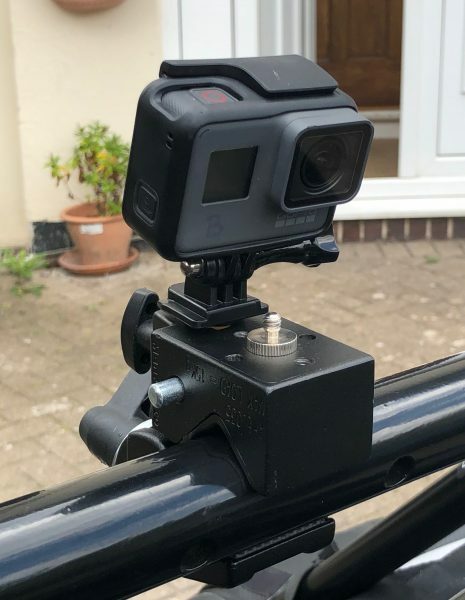 Cannon m6: Used for taking video around the Pearcefield carpark and I tried to take video over the top of the screen as we drove along… Of course that audio was useless, and I don’t think I used any of the over-the-windscreen footage – lesson learnt there. I tried a few shots using this camera through the windscreen but there were quickly too many bug splats on the screen and the camera’s autofocus latched onto them too much. Another lesson learnt, use manual focus in those scenarios. iPhone X: As usual the iPhone was in my pocket. 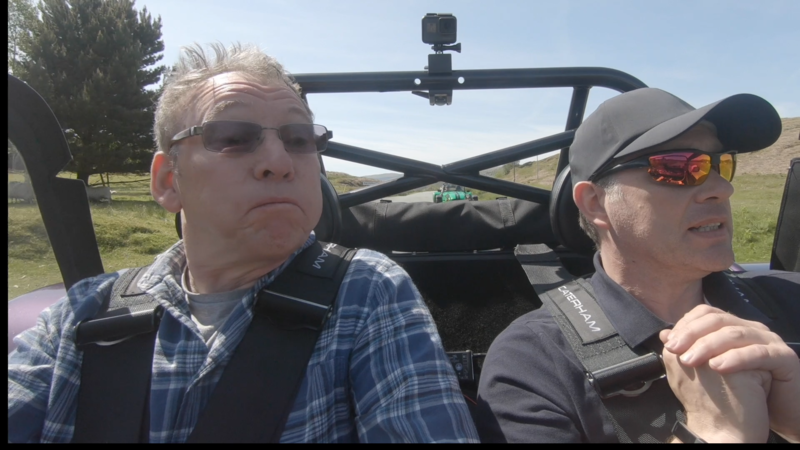 I took footage at the Piercefield and in the carpark in Aberdovey with it. It gives great results but I was being lazy and should have used another app (Filmic Pro) to set shutter speed and the like manually… The iPhone defaults to 60fps for video and that looks a bit sketchy when Final Cut re-rates is to 25fps. Mavic Air Drone: I took the Mavic Air because of it’s great video (up to 1080p) and compact size. My Mavic Pro isn’t that much bigger but its more imposing in the air and sometimes people don’t mind the Air buzzing around when they take exception to the Pro. My Phantom 4 would just be too big to get in the boot! 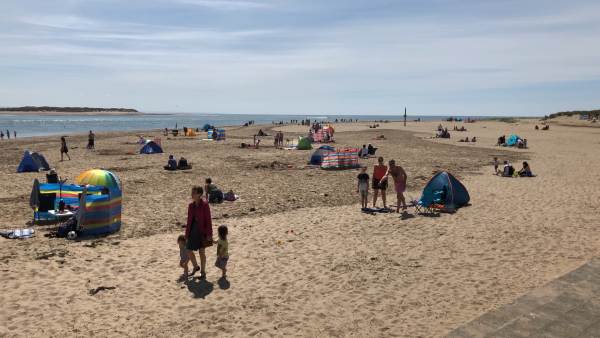 I got some footage of the Piercfield before we left and was going to try and get a shot of the carpark in Aberdovey but it took so long to get there that I didn’t want to spend the time sticking the drone up – we needed to get back. I set all the GoPro’s to take 2.7k 25fps footage and configured for wide angle rather than super-wide or linear. That allowed it to use its own image stabilisation (I chickened out on relying on it in post but might be happier with that now I know how good Final Cut can do in that respect). Going for 2.7k instead of 1080p also allowed me to crop the video down to 1080p in post without losing any resolution – 2.7k is 140% the size of 1080p so allowed a reasonable crop ratio if I needed it. Audio on the GoPro’s was set for high noise/wind environments. It perhaps didn’t need it on the Windscreen mount but I didn’t want to swap a camera over and then forget to set the noise reduction. Each GoPro had a 128GB card in them. Two of the three were ok for space but the one that got used as the windscreen cam the most ran out of space at the homebound fuel stop. 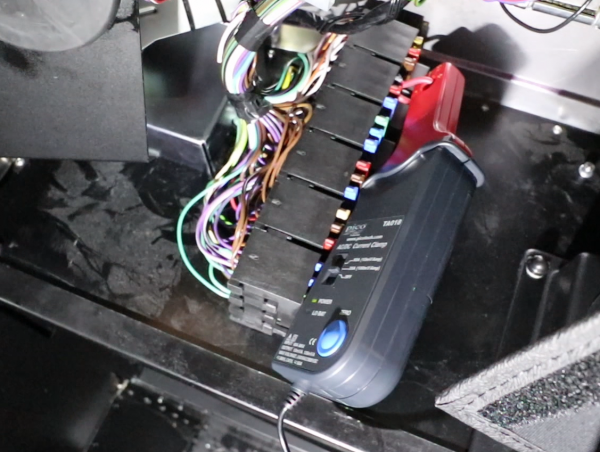 I did end up rotating the GoPro’s around as I switched batteries around as I charged them. 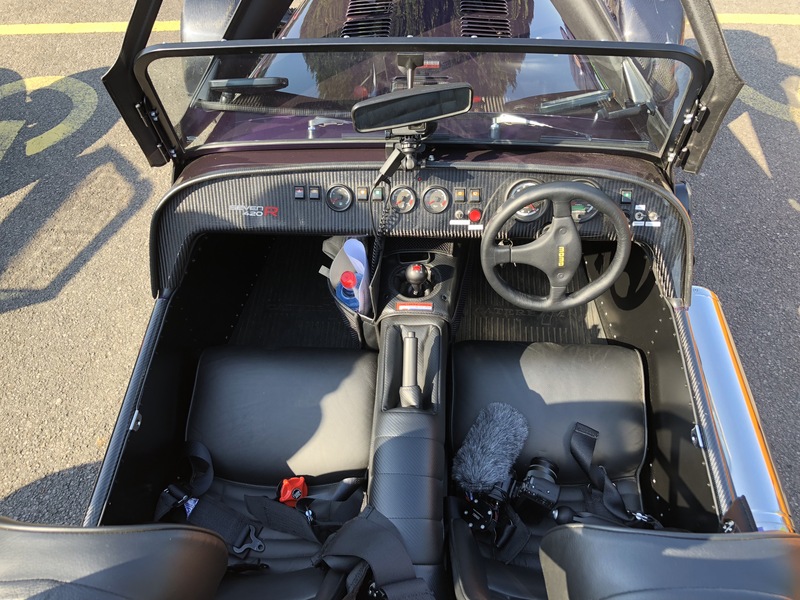 The windscreen mounted dash was hooked up to a USB charing cable and allowed me to keep that topped up and switch that battery into other GoPro’s as we went along. I’ll spare you the details of the edit for YouTube but it was a big learning curve for me. Stitching multiple GoPro segments together into compound clips and then pulling all the different camera angles together in multi-cam clips was new to me (other than some simple tests I’d done a while ago). It certainly made sense to do all the prep, colour correction, stabilisation etc on the footage at this stage – prior to dropping it into the timeline. The multicam support in Final Cut is awesome and made switching camera angles trivial instead of a right royal PITA. The exception to that is probably image stabilisation: if you do it on too long a clip then the stabilisation algorithm often crops too much of the image out to get to a stable shot… best doing stabilisation on clips in the timeline. In all I probably spent well over 20 hours on putting this 14+ minute video together… possibly even double that if I’m honest. A baptism of fire for my first YouTube video! Other than some tweaking of the 3 main GoPro mounts I think the video is good. I do need to take a lot more B-roll (supporting shots) but that’s probably always the case. The area where I need to spend a lot more time is on the audio. 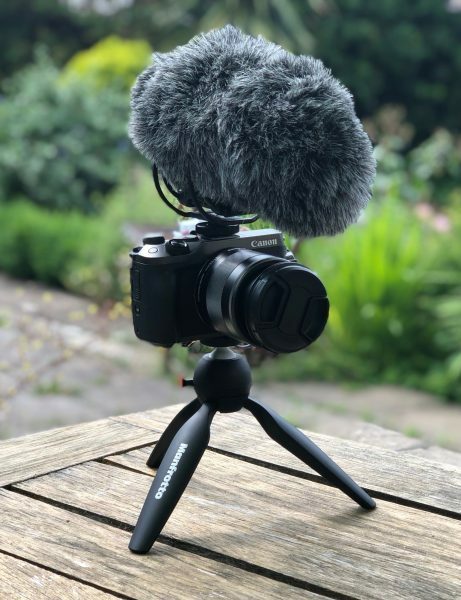 I still have lots of things to try here but I think I’ll be trying out the Zoom H6 multi-track recorder next to see if I can get some more audio sources and have more options in post. 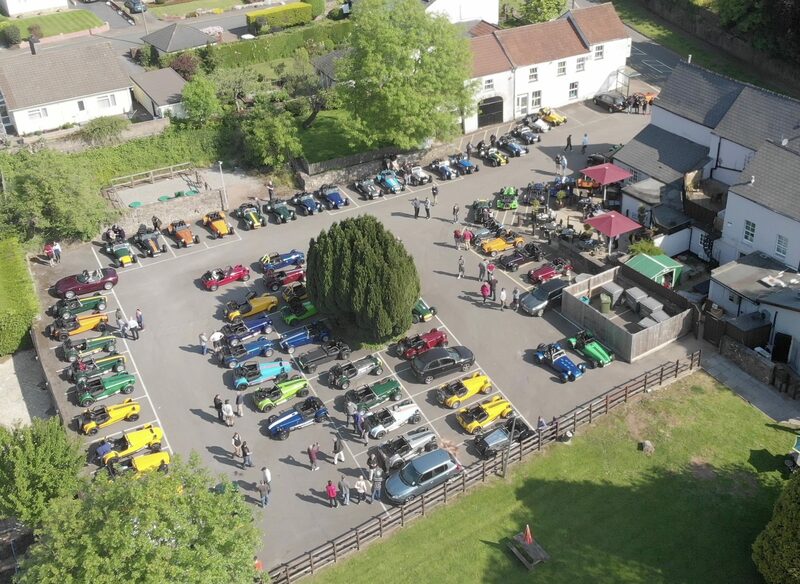 The Taffia Fish & Chip run is organised by the Welsh Area group of the Lotus7 enthusiasts club (www.lotus7.club). 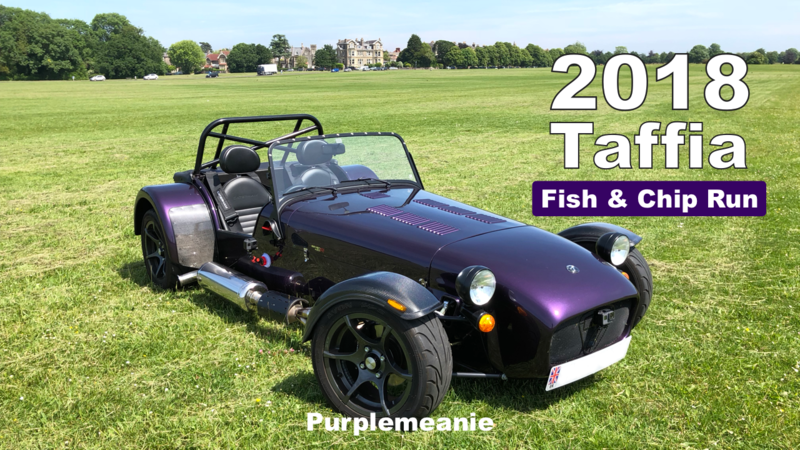 It tries to run every year (weather permitting) from The Piercefield pub, just outside of Chepstow, to the Welsh seaside town of Aberdovey – where everyone crams into Shelley’s, a small Fish & Chip shop, to partake of their wares and then to drive home again. It’s all just a big excuse to dash across the Welsh countryside and enjoy the driving and the views. This year’s event took place on May 19th with probably perfect weather conditions. Perhaps the only downside to the weather being so nice was that there were plenty of other people on the roads – but as long as you didn’t want to break any timing records for the run then the busy roads didn’t really matter. 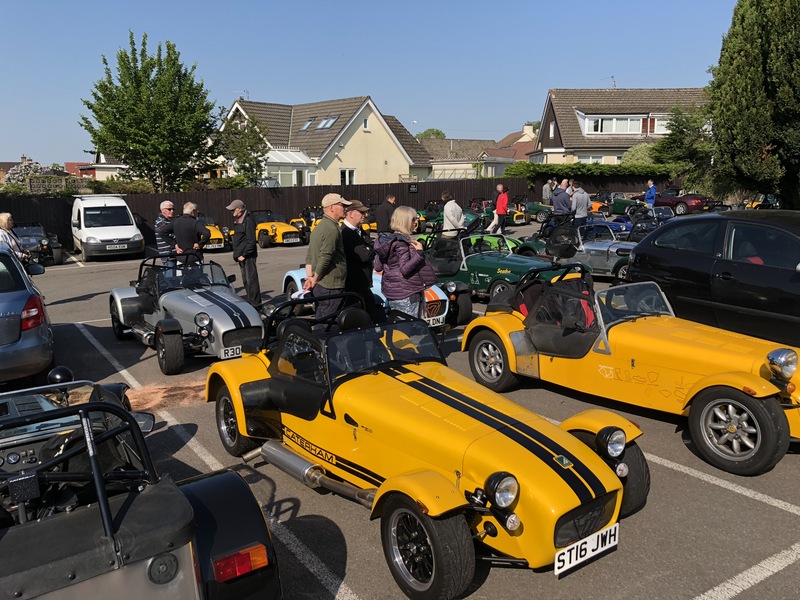 The kickoff in the Piercefield car-park was from 8:30 in the morning for bacon baps and coffee and leaving the car park at around 10. We decided for an 8:30 set off from Bristol with both Joel and Mike being eager and early. 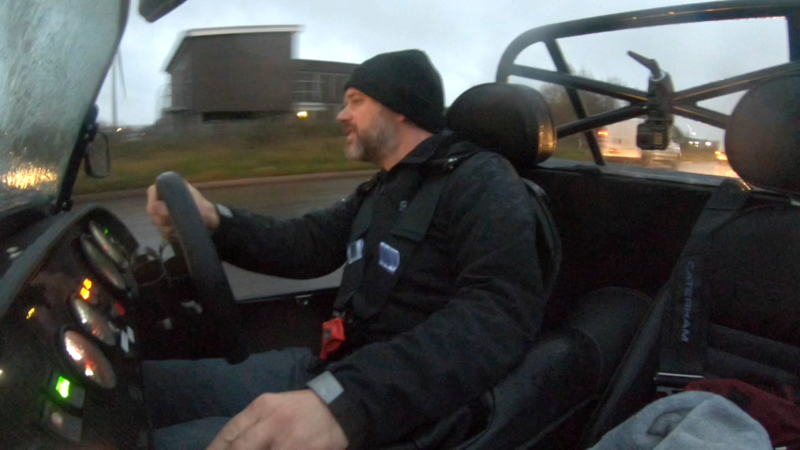 Joel was my co-driver for the day… a very reasonable £25 admin charge to put him on my policy. 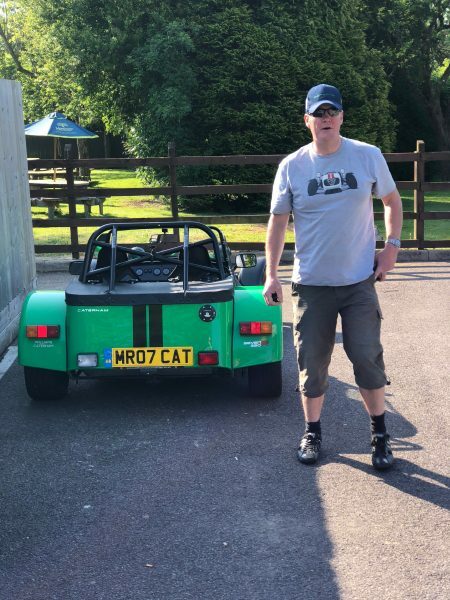 Mike is a local (about 300m from me) Caterham owner with a bright green 2017 360R. As we got closer to Chepstow we passed or collected another 5 or 6 Sevens on the roads into the pub. Clearly we weren’t going to be on our own. By the time we got there at just after 9 we found there was already about 60 cars in the carpark. We had a wander round the carpark, registered ourselves inside the pub and I took some video and drone footage. All while chatting to the other participants. We had a pep talk from one of the Welsh Area Rep from the club and then we all set off. Joel took the first leg of the jaunt from the Pub up to Llanwrthwl which was to be our fuel and coffee stop, loosely half way to the seaside. We almost immediately got caught up in a traffic jam that formed behind a group of cyclists heading out of Chepstow. We must have passed 50 cyclists over the course of the day – great to see so many people out enjoying the weather! 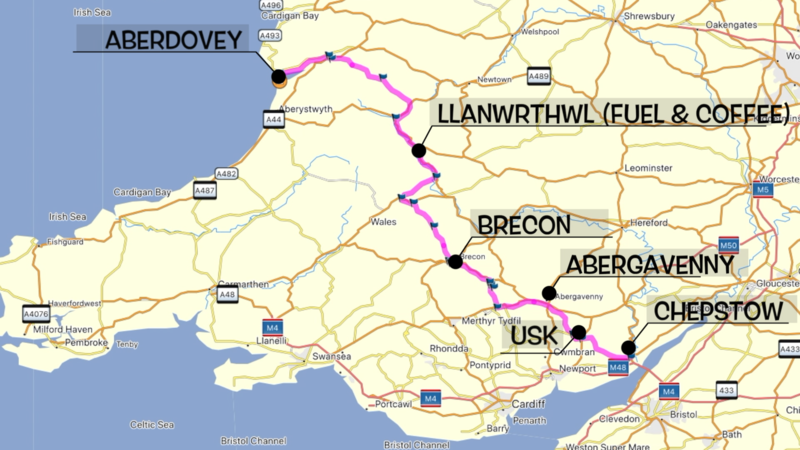 Then it was through Usk, south of Abergavenny, through Brecon and over the Brecon Beacons. The full route plan is at the bottom of this post if you’re interested so I won’t go over all of that now. It’s a very varied first leg though, small quiet villages, large towns, single track bridges and dual carriageways. It’s all in there except for perhaps a Motorway and a ford. The best part of this leg is across the Black Mountain section that all the car magazines and Top Gear have used in the past. As we crossed the black mountains we could see buzzards flying over head. There really were a lot of them. 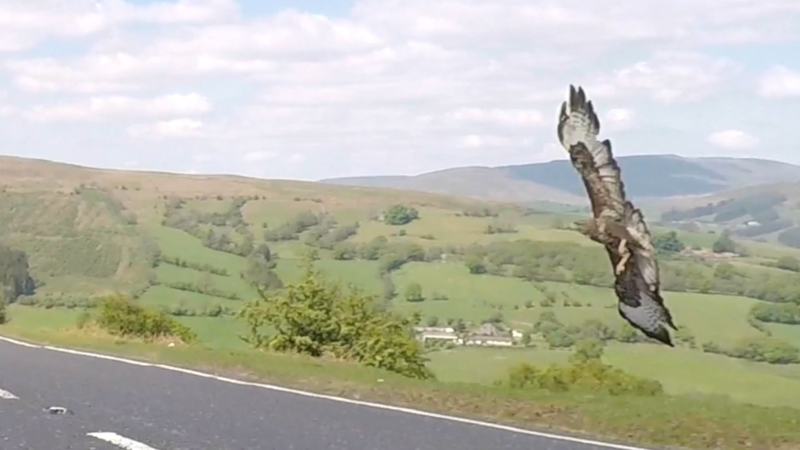 Then as we rounded a corner (Joel driving still) a buzzard took off from a tree in our peripheral vision. As we continued along the road it was clearly heading towards us, not intentionally I don’t think. Until we were clearly on a collision course and it then had to suddenly veer off. The cameras on the car caught it taking off all the way up to when it decided to abort it’s path. From the Black Mountains we followed the route below. 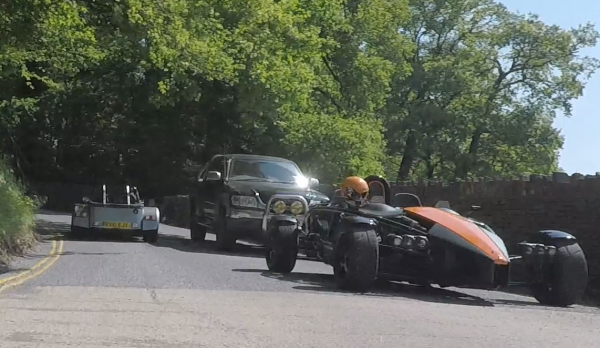 One interesting point was as we navigated the bridge at Coed-yr-ynys (at least I think that’s where it was) and saw a guy out in his Ariel Atom wearing a dashing Spider Man liveried helmet. He must have wondered what the hell was happening as dozens of Sevens passed him the other direction. 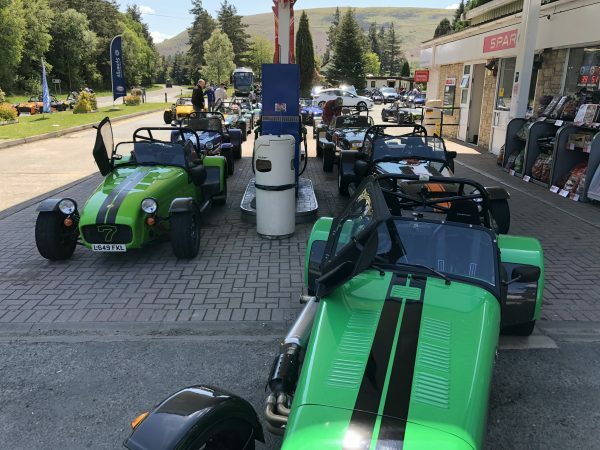 When we got to the roadside fuel and coffee stop in Llanwrthwl it seems that just about every other car on the run had got there too (for those interested here’s a link to the pronunciation of this town). I like to think I can have a fair bash at Welsh place names but I completely screwed it up in my video voiceover. It had taken us just over two hours to get to this point… this run was turning out to be a slow one. 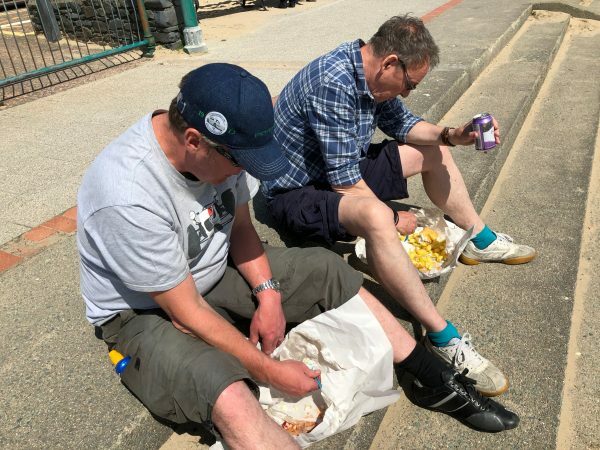 We had been told that we should have been at Aberdovey by 12:30… but that clearly wasn’t going to happen. We stopped for about 20 minutes at the garage and then headed out with just us in front and Mike behind – with me driving this time. It wasn’t long though before we came up behind another group and we were travelling in a larger convoy again. Perhaps the best part of the whole run is the section which I think runs from Staylittle to Machynlleth. When we finally got to Aberdovey it was about a 5 minute run through the town to the seafront. We just about all got into the pay-and-dislpay carpark I think – though the parking toll machine was causing problems for people – some who had only got cards and the machine wasn’t of this era. In all, including the fuel stop, it took about 4 hours to get to Aberdovey. Getting there just before 2PM. That’s quite a difference to the advertised 12:30 arrival that we’d been told, but hey, what the heck… that was more time behind the wheel. I can only think the extra time was due to the number of cars – we got a bit bunched up in places – and to the number of other people out on the roads. There was also a bit of a queue for fuel and coffee at the pit stop that probably added a bit of time to some people’s journey. 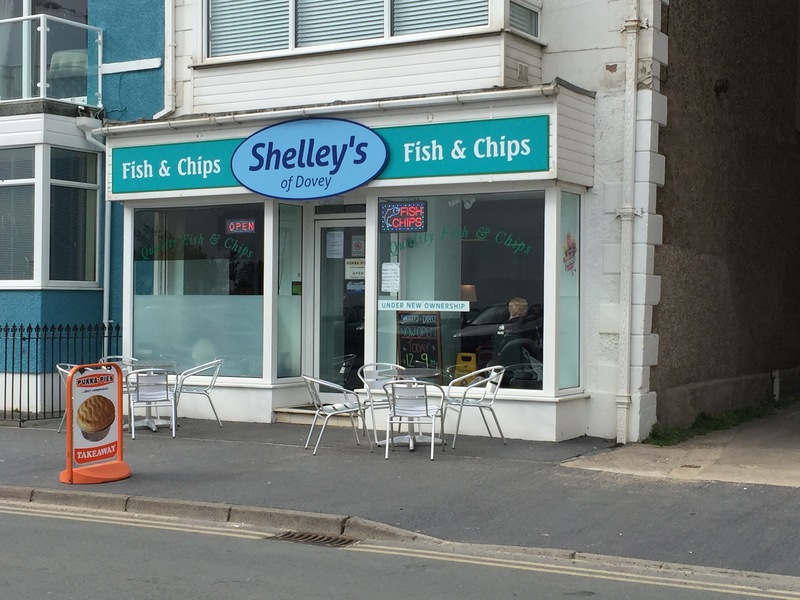 Shelley’s Fish and Chip shop were clearly expecting us – but perhaps not quite the numbers that turned up. All the tables inside had “Reserved for Lotus7 Club” written on them, so they knew we were coming. However, we were queuing out of the back of the shop and into the side alley-way when we got there. We had about a 10 minute wait to get served as I think a new batch of chips was coming through. No point in getting upset about these things and it was a great chance to have a chat with the people in the queue next to us. The staff were friendly when we got to be served and the chips were great. 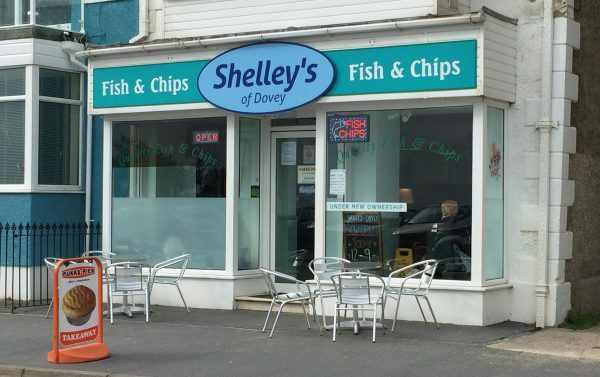 Shelley’s is highly recommended. We sat and ate our fish and chips on the sea front looking out over the beach… what’s not to like about British seaside towns when the weather’s fine? We left Aberdovey at about half past two and essentially reversed our route of the morning until we got to Abergavenny. At least this sheep had the good sense not to run right into us! 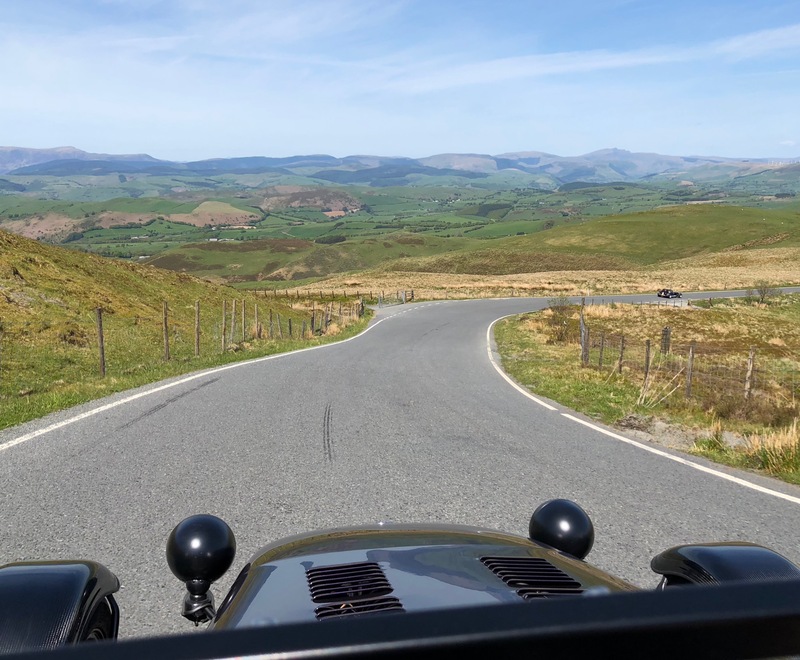 We stopped again at the same petrol station – we hadn’t planned to do that and had been looking for somewhere to stop for a few miles, it just so happened that we ended up there again. Once we got to Abergavenny we just took the sign posts for home. That got us down onto the M4 motorway and it was a “quick” blast back. I’m not too sure of when we exactly got back to Bristol. We dropped Mike off at his place on the way through and from the timestamp on the picture below we probably got home about 5:45. So about 3 hours 15 to get back. From other reports I’ve seen it seems that in the end 86 cars left The Piercefield Pub and were joined by another at the fuel stop. Then 8 more cars rendezvous’ed with us later on – making a grand total of 95 cars for the run. Amazing! And a record! All in all an absolutely fantastic day out. One of those days to remember for a very long time. That video is about 15 minutes and took a lot of work to get it down to something that won’t bore the hind legs off a donkey – as they say. If there’s demand then I could put together a longer video with more sections that I’d missed if people are interested. Let me know if you’d like to see that happen. There’ll be another more in-depth post about how the YouTube video came together and can be found here. 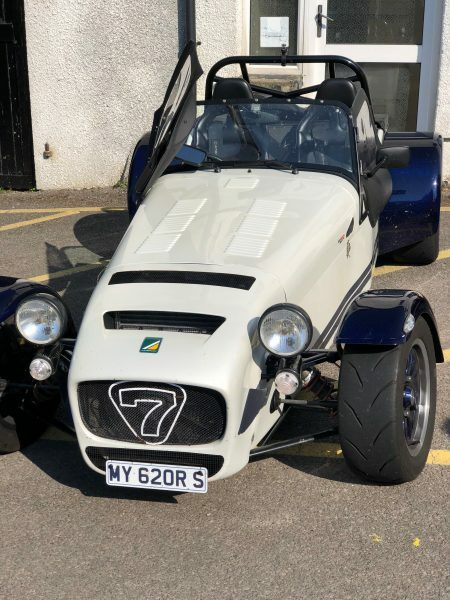 Here’s some Links from Lotus7.club Website in case you’re looking for other info on the run – you may need to be a member to see them though. I’ve taken the following route plan from the Lotus7.club forums, I’ve pasted them here in case you fancy taking a similar trip, but be warned… I think some of the directions are a little sketchy in places and you should expect to get lost once in a while if you follow them – but all part of the fun of it! Turn RIGHT out of pub car park onto A466, follow the road past racecourse to roundabout. Continue straight ahead. CAUTION – Complicated bit coming up!! At big roundabout, drive ahead and under bridge, continue 200m to second roundabout. Continue along this road into town – fuel stop here! After the Petrol Station Turn RIGHT at the mini roundabout. Continue along this road until you enter the village of Upper Chapel☺, top road! Just before Trout Inn and garage Turn Right onto B4358, follow road. 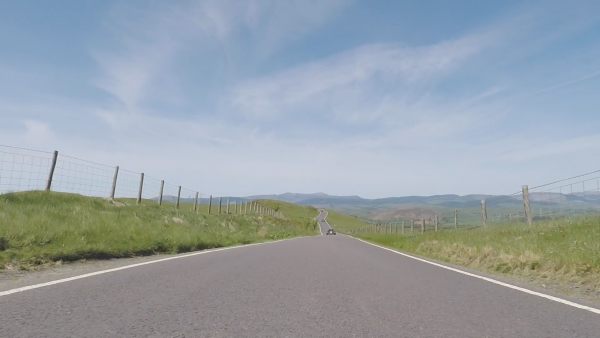 Continue all the way towards Builth Wells. Stop at Halt Café for refreshments / weight reduction / grief from the co-driver …. Plus fuel stop here! Turn LEFT out of café back onto A470, follow to Rhayader. Continue along A470 for loads of miles until you come to a roundabout. Continue along this great road to Machynlleth. Continue through town. At T junction turn right onto A487 sign posted Dolgellau. We will gather on the seafront in the carpark near the fish and chip shop – He is expecting us. BE CAREFULL of pedestrians, they may damage your nose cone if you hit one!!!! The route home is the reverse of the morning run. Back with Some Stats – How Much Time! It’s been three very cold and wet months since I got the car on the road. We’ve had the Beast From The East and it’s lesser sibling, The Mini Beast From The East, along with a bunch of rain and a good dose of a stinker of a cold that kept me inside for too long. Suffice to say I’ve not been out in the car much. As I write this (end of March 2018) the car only has about 160 miles on the clock and 70 of those were in the last 3 days. There’ll be more on that in a future post though. So, as well as keeping a Blog on this website while I was building, I also kept a written record of how much time I was spending, both on the website and on the build. I also totted up a few other items in case anyone’s interested. The numbers are “about right”… I think. Don’t quote me to the second, I may have missed recording a time and had to think back as to how long it took, but I don’t think I missed anything big, or I’m too wildy out. That’s a lot longer than I thought it would take… and also a lot longer than Caterham tell you it will take. Double what I had hoped. Where did all the time go…? Well there’s more detail below if you really want to the gorey mess of it… but in the end, it went into the “fun” of it. I really enjoyed the build and I probably took longer because I was enjoying getting it all done the way I thought it should be done, and not just the quickest way. It also seemed to take forever to get over the final line. Endless jobs to tidy and do the IVA tasks. In the end I did just about everything I could find that was required by IVA. Perhaps all of them weren’t necessary but the way I look at it – it passed first time! Could you do it faster – certainly… especially with the swanky new Ikea style build manual. Would you have as much fun – depending on your goals… maybe. Would I have had as much fun doing it more quickly – absolutely not. It was a fantastic 162 hours of glorious fun! What’s not included: I haven’t included any research time. As well at the hours of building and blogging I did many, many hours of reading all the blogs, forums and facebook posts I could find. I’m sure there was at least another 100 hours in research – both before and during the build. If you’re interested (and a real sucker for punishment), then at the bottom of this post I’ve put my whole build log. I recorded all the major work items, and even lumped in the not-so-major items. 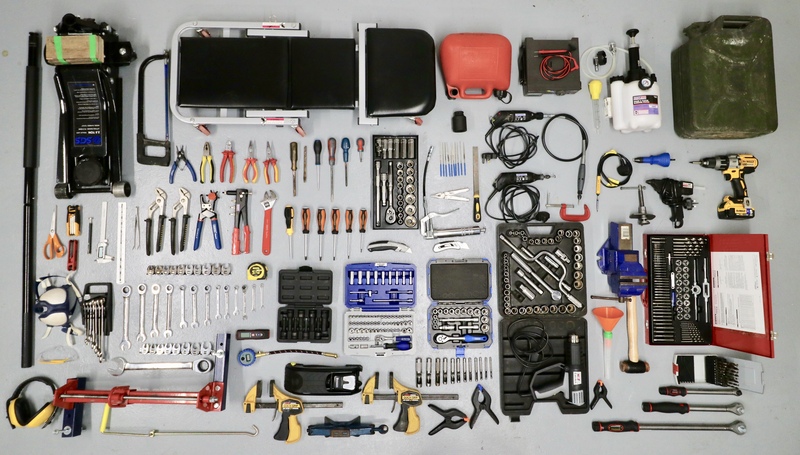 I can’t guarantee that I captured absolutely everything, but if you’ve been a follower of the blog you should get a sense of whether I’m the meticulous type or not. At some point, I might try and put this information back into the gantt chart I first created. I know there were a bunch of you that said it would take me longer than in the gantt… but hey you’re only young once. Of course there were the usual test-drives, spec’ing, paying etc etc. 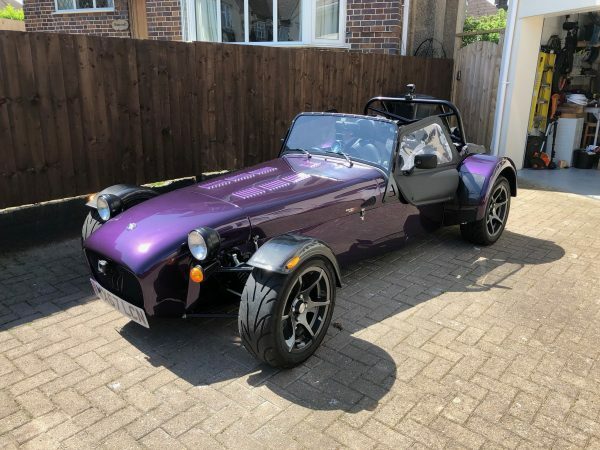 But I also had a few trips out to poke around their stock to see how things were done on an already built car, and I also made trips to pick up my bonnet and a different track day roll-bar. And while we’re on the subject of roll-over bars… bear in mind that some clubs (i.e. Lotus7.club) insist on the FIA track-day roll-over bar – the one with the diagonal braces running across the car. If you go for the standard roll-over then no-tracky-with-them! They won’t allow you to enter one of their track days unless you have at least the FIA track-day roll-over bar. A visit to take my bruised, and already late, bonnet back to be reworked. 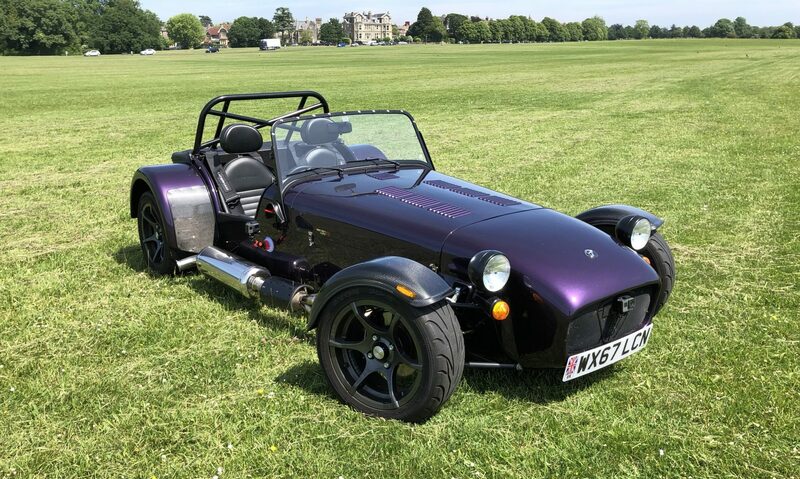 I could have got them to pick it up but decided a trip to the showroom was going to get it there faster… and… it was a worthwhile day out that I hardly needed an excuse for. I learnt a lot from poking around the cars there and also got talking to other builders and mechanics which was also really helpful too. I’ve talked about my reasons for blogging (here) and some of the very first comments I got back on my first few posts were – “more pictures please”. We all know a picture paints a thousand words and nothing more so than when you’re trying to explain something technical. Of course you need to take pictures as part of the submission to IVA, but I only provided them with half a dozen or so. So, taking lots of pictures wasn’t for their benefit. In the end I found it really, really useful to refer back to pictures I’d taken from earlier in the build. I’ve also been able to dig through the collection when people have asked questions later and I’ve been able to find something that didn’t make the blog but showed exactly how I’d done something. I’ve enjoyed having the photo collection to go back through and I hope you enjoy the montage header picture on this post – which is (most of) the pictures uploaded to the site so far… in a montage (ImageMagick if anyone’s interested). I think there are 504 images in that montage – don’t ask about why there’s a difference between the 504 here and the 601 mentioned below… there just is – right! I think that’s way more than I was expecting and probably took forever for people to download as they read the posts… but it seems they helped a bunch of people through their own builds so hopefully worth it in the end. I never would have guessed that – honestly! I thought I was trying to keep the traffic to Derek to a minimum. Hmmm. Derek was great, and often surprised me with how quickly he got back… but sometimes not so too… so don’t rely on him for a guaranteed response if you’re in a rush, would be my recommendation – but realistically, nobody promised that either. Derek wasn’t always as chatty in return… some of the disparity in numbers comes from me replying “thanks” or “ok” a few times. But, also Derek, I’m sure, has other jobs to do and so his responses could sometimes just be “yes” or “no” – which left my questions answered but sometimes a little lost as to actually how I had to move forwards. However, for the overwhelming majority of the time, Derek’s answers were great and left no room for confusion. (The one exception to that was the pictures he sent of the washer bottle install, in the boot, that didn’t include the non-return valve and caused water to spray the windscreen whenever the brakes were applied as I drove the car for the first few times! 🙂 … more on that in a future post). Yes, that’s right, not far off a TeraByte of media… mostly video. For the whole of the build I had at least 2 GoPro’s running. 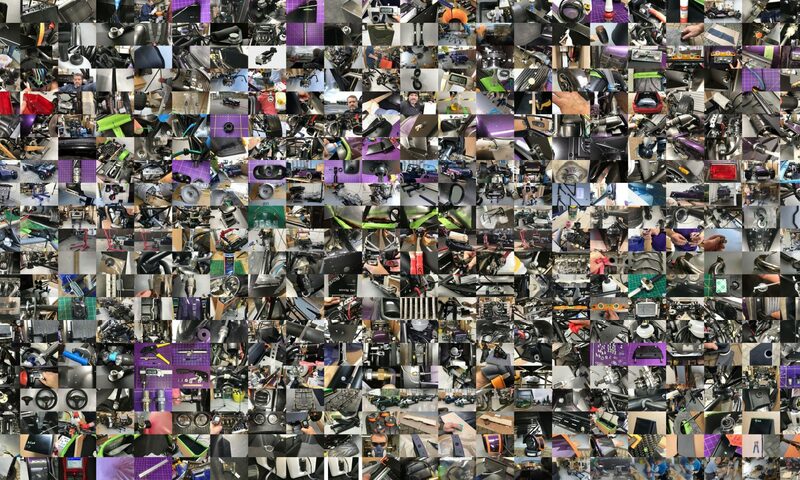 I have many, many hours of video that, one day, I hope to make a time-lapse or even a “These are the Steps to Make a Car” video. I had started off thinking I would do a VLog as well as a Blog. However, it became clear very soon into the build that building, blogging and vlogging would have been too much. The general rule seems to be that 10 minutes of video takes about 200 minutes to film and about another 100 minutes to edit. And as you can see below… I spent almost as much time blogging as building and to edit and post a VLog was going to take me way over the time I had available. Sorry no VLOG – yet. Hopefully you’ve all read them! They were great weren’t they? Phew! That’s some piece of work! I could have built another car in that time, or at least I could do now I know what I’m doing! Whilst not exactly the web’s most visited site, I’m pleased that there has been at least a few people interested to take a look at the fun we’ve had. From the start of the blog to March 26th 2018 (just over a year), the website has had some 9,500 views. And for those of you interested… a view is counted when a visitor loads or reloads a page. That’s it for stats… I hope you enjoyed the journey so far…! Good night insomniacs… go to bed!